Council’s desire to move quickly towards new skate-boarding facilities is welcome, but Matty Day, youth advocate and leading light of local skateboarders with extensive experience in the industry, says the plans before council are flawed and cautions against haste. Councillors last night considered a preliminary master plan drawn up by a local architectural firm. There were two options, fairly similar but with Option B recommended to them as a “shovel-ready project” – in other words, all set to go once finances are secured. The price tag was estimated at half a million, an amount that “amazed” Mayor Damien Ryan. Councillor Brendan Heenan wanted to know what the figures were based on: had they been out-sourced to firms who do skateparks all around Australia? Right: The recent Alice Springs Titles at the skatepark. No, they were based on in-house construction data, replied Director of Technical Services, Greg Buxton. He said he would review the costs prior to council’s Ordinary Meeting at the end of the month. Cr Heenan’s question was spot on as was Cr Eli Melky’s wish to consult with stakeholders – skaters and riders – before committing to the plan, says Mr Day. He also appreciated Cr Liz Martin’s understanding that providing a better space for skaters is a great opportunity for council to work with the town’s youth. 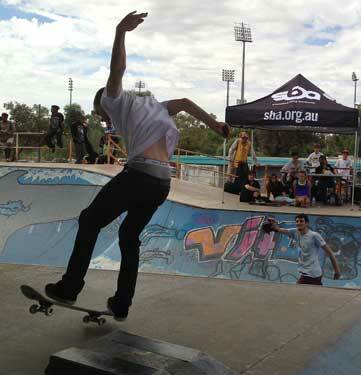 Skatepark design is a matter of expertise, says Mr Day, and council had before it excellent examples of what has been achieved in the regional towns of Port Augusta and Geelong. In the case of Port Augusta, it was with a similar price tag. On the basis of current plans, council would be investing in expensive new facilities that would be partially un-skateable and potentially dangerous. For example, the plans include two very large sets of stairs but with no run-up, which renders them useless. In any case, such stair sets are for very advanced skaters, says Mr Day, and thus not suitable for the majority of local users. The peanut bowl either does not have a flat bottom or its size is inadequate – an elementary mistake, he says. Council already has a relationship with CONVIC Constructions. Why don’t they go back to them now to finish off what was started, Mr Day asks. Why spend money instead with an architectural firm which appears not to have knowledge of this specialist field? CONVIC have 600 skateparks around Australia to their credit, with the “latest and greatest” being the Fremantle Youth Plaza, “a huge success”, says Mr Day. “This is the type of facility we should aim for in the long term for Alice Springs,” he says, suggesting that it be located in the vicinity of the Flynn Church as was recommended in the Todd Mall revitalisation consultation. Such a state of the art facility would cater to multiple user groups, with a fitness circuit and ball sport spaces as well as riding surfaces. In the meantime, council should proceed to “finish off and fix up” the existing facility, which is developing significant safety issues. His submission included photographs of cracked surfaces, eroding embankments, and gravel and sand spilling on to the skatepark from its un-landscaped surrounds, greatly increasing the chance of injury to skaters and riders. It is paramount that 1 of the 2 Australian Skatepark Building Companies is used. These are Concrete Skateparks and Convic. These guys know all there is know about design and function. It’s truly important for all parties to realise this, as spending a ton of cash on a park that doesn’t work is a waste of everybody’s time. My current job is travelling around Australia and documenting ALL skateparks small and large in every community, town and city. I visited Alice Springs less than a month ago and Matty Day welcomed me into his home and to come along to his skate school. This man knows how these things should be taken care of, end of story. Thanks for having me, Alice Springs, you truly stole my heart and I look forward to returning next year. Reminds of the Mall Redevelopment. Lack of consultation. By consultation I mean actually listening to the locals before key decisions had been finalised. They are still fixing up mistakes and guess what … let’s waste some more money, putting in extra shade structures because we didn’t listen to the locals who suggested we add more parking and suitable shaded areas. Shame on the Council. Another missed opportunity. Why would Council build what local experts are already saying is inadequate and a wasted opportunity. I find it astonishing that ASTC would even consider building a new park without fully considering local and national expertise. Even a non-participant can see that skateboarding quickly becomes an extreme sport, and extreme sports deserve appropriate facilities. If this Council lacks the vision to get this right, can they please just fix the present one as best they can and leave well enough alone until another Council has a chance to look at it? Mr Day makes many valid points here. Flow is a key part of a park. Without it, it renders a park almost useless. If this is to work you need to consult the core users and then the park needs to be built by qualified skatepark builders. You only need to look at parks like Armidale in the New England region of NSW. It is impossible to link tricks from one obstacle to another. Only someone with many years of experience building and designing skateparks understands the concept of what it takes to make a park user friendly. Also facilities like toilets and disabled access need to be considered. Skateboarding Australia have been developing skatepark facility guidelines to help councils build parks right the first time. Might be worth consulting them before signing the dotted line! The upgrade or finishing work we are proposing is closer to the following link. Unfortunately the process thus far has not allowed the user group and opportunity to express this. The one and only opportunity that was granted to us involved answering four to five ASTC prescribed questions on a sheet of A4 paper, that didn’t allow scope for conversation or presentation in a short window of time. Most councils nowadays consult user groups in open forums on social media over extended periods of time this is seen as inclusive and more likely to capture are wider user group voice. Average turnaround time for funding for projects of this scale on average is around six to 12 months to clarify the concern that raised at the meeting that it would take five years to get a project like this up. Time for council to set up on this one and get the job done properly. No excuses. No games. We want a result like Collie. Our kids need it, our kids deserve it. Typical WOFTAM (ED – ‘Waste of f-ing time and money’, according to the Urban Dictionary). How about this? Demolish the current and rebuild it new and get it right. It’s only a matter of time before there is a very serious injury there as it is.